My dog has been diagnosed with "reverse sneezing." What is it? Some dogs have a condition known as paroxysmal respiration or, as it is more commonly called, "reverse sneezing". "With this condition, the dog rapidly pulls air into the nose, whereas in a 'regular' sneeze, the air is rapidly pushed outthrough the nose." With this condition, the dog rapidly pulls air into the nose, whereas in a 'regular' sneeze, the air is rapidly pushed out through the nose. The dog makes a snorting sound and seems to be trying to inhale while sneezing. Is my dog in danger when this occurs? Although it can be alarming to witness a dog having a reverse sneezing episode, it is not a harmful condition and there are no ill effects. The dog is completely normal before and after the episode. 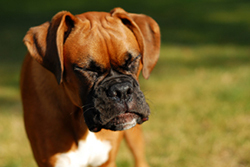 During a reverse sneeze, the dog will make rapid and long inspirations, stand still, and extend his head and neck. A loud snorting sound is produced, which may make you think the dog has something caught in his nose or throat. A reverse sneezing episode can last for several seconds to a minute. What causes the "reverse sneeze"? The exact cause of a reverse sneeze is unknown. This problem seems to be exacerbated by allergies and environmental odors such as smoke, potpourri and perfume. Dogs with narrow nasal passages (long noses) seem to be more commonly affected. How is a "reverse sneeze diagnosed"? The diagnosis is based on medical history and clinical signs. Your veterinarian will rule out other causes of abnormal breathing and snorting, such as an upper respiratory tract infection, collapsing trachea, nasal tumors or polyps, foreign bodies in the nasal passages or mouth, and so forth. Occasionally your veterinarian will perform blood tests, allergy tests or radiographs to rule out other conditions that can cause similar symptoms. How is "reverse sneeze" treated? "Most cases of reverse sneezing require no medical treatment." Most cases of reverse sneezing require no medical treatment. If your dog experiences a reverse sneezing episode, you may gently stroke the neck and try to calm the pet. Once the dog exhales through the nose, the attack is usually over. It is very rare for dogs to develop any complications or suffer any risk during these attacks. Most episodes of reverse sneeze last less than a minute, although longer durations have been reported. In certain cases, your veterinarian may choose to prescribe anti-inflammatory, anti-histamine or decongestant medications to help with your dog's condition.